Reading Kelle Groom’s debut memoir, I Wore the Ocean in the Shape of a Girl is like happening by a three-car pileup on a dark, winding road. It’s hard and sometimes ugly to look at. There’s blood and pain and blackness. There are shattered lives everywhere. And yet, under the heaving starlit sky, there’s a beautiful synchronicity about it all. Maybe it’s the way the glass skirts across the pavement, the way the smoke moves across the landscape over a perfect hum of approaching sirens. Everything is still and yet moving at once. Then, in the middle of the symphony of destruction and chaos, you find her: the lone survivor. Her (the nurse’s) arms are like bridges, transporting my son to me in this breathing world. I feel as though my vision could fill with white clouds at any moment, that I could fall to the floor. I feel that someone should be steadying me. But the weight of him is in my hands. And it is like carrying him inside my body—something I already know how to do. In the beginning, when I fight, it’s like being underwater after a big wave, unable to find which way is up, holding my breath. I push as hard as I can, but the weights is like rocks, heavy furniture, unmoving, as though I’m buried in the lock. I push again from some other place, as if I’m pushing to be born, shocked it’s not enough. He was the one who almost embarrassed me into sanity. Careful of the cops I keep my bottle low while I’m driving down the highway. It [drinking] burns in stages, like an elevator. I just want to live. Can’t think of anything more than two breaths ahead. (I) drank until my skin burned underneath like soft pear flesh cooking in sugar, jam boiling. The attempts at sobriety and the subsequent relapses are cars crashing into one another over and over again. Groom falls often, and she falls far and deep before there is a lightness. Yet we read and stay with her the entire time, even when we are pulled so far into the carnage that it seems impossible for any of us, Groom included, to crawl away alive. And the reason we stay, the reason we cannot look away, is because I am not sure that in my lifetime I have ever read anything so rooted in the collective experience of being a woman. I have never been an addict, have never lost a child, yet the way Groom articulates the deepest recesses of the female psyche made me feel a sense of recognition that I have never felt before. As a woman, I have felt the boil of self-loathing in my belly. I have treated myself with less respect than I would a complete stranger. 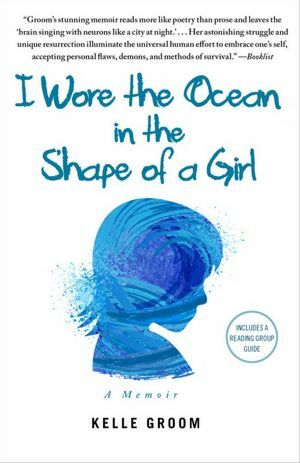 And while reading I Wore the Ocean in the Shape of a Girl, I felt suddenly and profoundly….understood. Amye Archer holds an MFA from Wilkes University and lives at www.amyearcher.com.